Hi, all – Scott here. I was recently asked what podcast feeds I subscribe to. The answer sounded like a good post, so here it is – I’ll twist Jesse’s arm for his subscribed list, too. Evo Terra and Michael R. Mennenga host all three of these shows, which are easily the most professional science fiction-related podcasts out there. Cover to Cover features author interviews and book news, Slice of Sci Fi focuses mainly on television and films, and Wingin’ It is 100% format free! Only two podcasts in, and this is my favorite podcast. 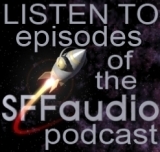 The ninjas are Summer Brooks and Joe Murphy, and they talk “old-school” SF and Fantasy. The first show was about Dan Simmons’ Hyperion, and the second featured Heinlein’s Stranger in a Strange Land. Looks like Zelazny’s Lord of Light is next. Summer and Joe can also be heard on some of the The Dragon Page broadcasts. Stephen Eley has really put together something special here. Escape Pod is an excellent audio science fiction magazine with high quality stories that sound great. I enjoy Eley’s introductions as well, which have ranged from “Go see Serenity” sermons to discussions of copyright. He makes me chuckle often, and I’m pretty sure it’s on purpose. Aaron Macom hosts this show, which is really just him talking about whatever the heck he feels like talking about. Most of the time, his topics relate to science fiction media, but his forays into other subjects are just as interesting. Rich Dostie (Rico) talks Star Trek – mostly. I was happy to find this podcast because I am a Trek fan and this is the closest thing to a Star Trek-only podcast that I’ve found. Rico highlights an episode of Trek in each podcast, and talks about collectibles and other related stuff. This is Cory Doctorow, reading his own work wherever he happens to be. Great stuff. The fine folks at ZBS are podcasting Ruby 1 – I urge you to check it out if you’ve never heard it. Every day, this feed delivers the next short segment of Ruby 1. As I understand it, it was originally broadcast in these short segments on NPR. And that’s it! I listen to these on my PC (if I’m sitting there) or on my Palm Zire 31, which features an excellent MP3 player. (That reminds me – I’ve been meaning to prepare a post on listening devices.) Last week, I dropped a few podcasts because I simply am out of time. I still have audiobooks to listen to, ya know? Thanks to all of the above for podcasting. I use iPodder (Juice Receiver) to download all these shows. Roger Zelazny wrote some of my favorite fantasies. I view him now as one of Neil Gaiman’s primary influences, as they both cover the same mythical territory in their fiction. (In fact, Neil Gaiman would be a perfect choice to pen scripts for Zelazny’s Amber novels – hint hint nudge nudge). 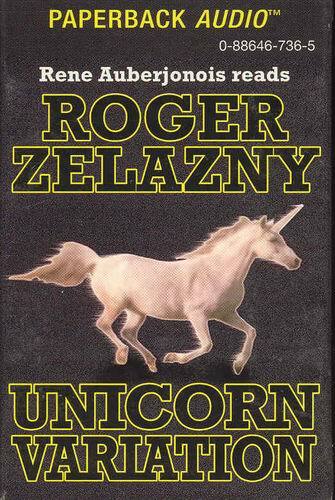 “Unicorn Variations” is a story from later in Zelazny’s career. In it, a man finds himself playing a chess game with a unicorn, the result of which could determine the fate of the human race. The unicorn talks quite a bit and has a sharp tongue with a dry sense of humor. The man in the story meets several mythical beasts, and they all know how to play chess, including Sasquatches, who are particularly good at it. A thoroughly enjoyable story. “Angel, Dark Angel” is also included. It is much shorter than the cover story, and begins with a man who receives a phone call giving him the identity of a person he’s got to go meet. No more on this one – let Zelazny unfold it for you. Rene Auberjonois is absolutely first-rate. I really enjoy his cadence and his personable tone. In the first story, he has the opportunity to use several different voices, which he does with wonderful skill, bringing the story to life as a great narrator can. This one’s out of print – check eBay! At the beginning of this book, Corwin, an immortal prince of Amber, wakes up in a hospital bed without his memory. He slowly figures things out – who he is, where he is, and most interesting, who’s on his side and who isn’t. As he goes through this process, so does the listener, discovering the world through Corwin’s eyes. But Corwin is not just human. He’s a member of the royal family of Amber, which is the only true world there is. All other worlds in the universe, including the one in which you and I sit, are but shadows of Amber. One gets to Amber only if one remembers exactly what Amber looks like, and if one has the power to subtly change the environment until it matches the one true world. The royal family of Amber is dysfunctional, to say the least. Corwin has many brothers, among them Eric, Random, Bleys, and Caine. They all want the throne, and some are willing to kill for it. As Corwin becomes more aware, he too faces that decision – how far is he willing to go to gain the throne himself? Roger Zelazny narrates this unabridged novel. He has a deep voice that I’ve heard compared to Bogart’s – takes a little getting used to, but the result is personal and satisfying. The novel is wonderful – vintage Zelazny. I was delighted when I first found this (and the other four Amber novels) on unabridged audio. It was published by Sunset Productions in both unabridged and abridged formats. 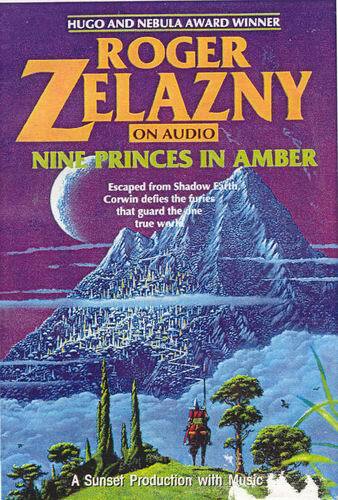 The abridged version is “enhanced” with sound effects, and features changes to Zelazny’s voice to indicate that the narrator is in a library or underwater, etc… that version is an example of an audiobook that has been overwhelmed with sound effects at the cost of the material. I much prefer this unabridged version, not only because it’s unabridged, but also because it is Zelazny’s reading without distortion. Americana Publishing now owns the rights to the Sunset Productions, and has re-released the Amber novels, unfortunately only in the abridged format.